Ari Fleischer was critical of the president's lack of empathy toward survivors. President Donald Trump tweeted a message for the people of Texas suffering through Hurricane Harvey Wednesday morning, a day after he received some criticism for not focusing more on the human toll of the disaster during his visit to Texas Tuesday. During the visit, which took him to Corpus Christi and Austin, Trump thanked government officials and emergency response leaders for their work in the aftermath of Hurricane Harvey on Tuesday, but did not make specific reference to victims of the storm -- a departure from comments ordinarily made by presidents visiting disaster locations. The president made three separate public remarks on Tuesday, but made only a brief mention of those suffering in Harvey's wake, and did not acknowledge those who lost their lives in the hurricane. Instead, he focused his comments on praising the response effort, and even made direct mention of the size of the crowd that came to see him. The omission garnered notice from former White House Press Secretary Ari Fleischer, who served under President George W. Bush and was recently hired as a commentator by FOX News. "I was with President Bush when he went to see the devastation caused by fires in Missouri and Arizona and tornadoes in Missouri," Fleischer told Fox News' "America's News Headquarters" on Tuesday evening. "There was something missing from what President Trump said -- that’s the empathy for the people who suffer. In my opinion, that should’ve been the first thing he said, that his heart goes out to those people in Houston who are going through this and that the government is here to help them recover from this." At least 31 people have died in the storm, according to The Associated Press, including a Houston police officer. Six more victims in Harris County, home to Houston, were confirmed dead by officials late Wednesday. Thousands of people have been evacuated across the Gulf Coast in Texas and Louisiana due to unprecedented flooding. Trump lauded emergency responders, but said he did not want to offer premature congratulations. "We won't say congratulations," Trump said in Corpus Christi, Texas, Tuesday. "We don't want to do that. We don't want to congratulate. We'll congratulate each other when it's all finished." 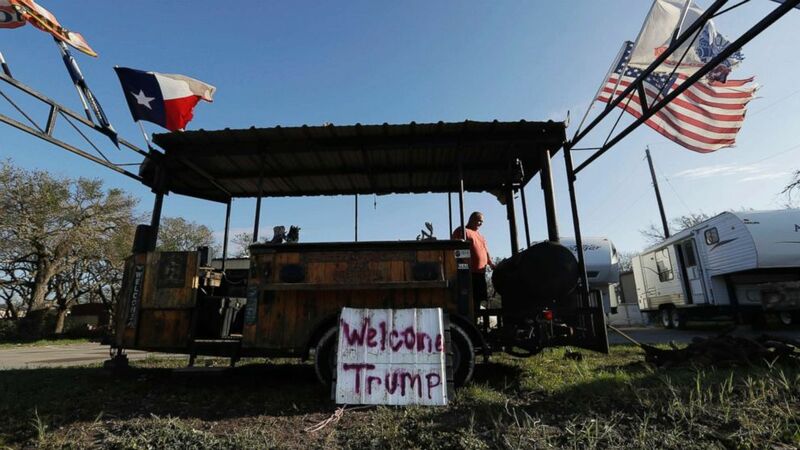 He visited parts of Texas ravaged by the storm, a trip that is providing him with the opportunity to demonstrate his handling of a natural disaster as commander in chief. White House press secretary Sarah Sanders told reporters later in the day Tuesday that the president plans to return to Texas on Saturday to visit areas he was unable to, and to meet with evacuees. Sanders said the president's priority during Tuesday's visit was to not disrupt recovery and relief efforts. Trump portrayed the situation at a briefing Tuesday with Texas Gov. Greg Abbott and FEMA Administrator Brock Long as one that he hopes sets the standard for emergency response in coming years. "We want to be looked at in five years, in 10 years from now as 'This is the way to do it,'" Trump said. "This was of epic proportion. Nobody's ever seen anything like this, and I just want to say that working with the governor and his entire team has been an honor for us." The president and first lady Melania Trump touched down at 11:25 a.m. local time in Corpus Christi, near where the hurricane made landfall Friday evening. He continued to Austin for a tour of the emergency operations center there and for a hurricane briefing with state leaders. He is expected to return to the White House tonight. Trump was also accompanied by Health and Human Services Secretary Tom Price, acting Department of Homeland Security Secretary Elaine Duke, Housing and Urban Development Secretary Ben Carson and Small Business Administration Administrator Linda McMahon. Abbott, who greeted the presidential party on its arrival, told reporters shortly before Air Force One landed that it was important for the president to visit the state and that Trump and his team have been talking about providing additional aid. "We want him to see and understand the enormous challenges that Texas has faced and the need and the aid that he's provided," Abbott said. During a news conference Monday, Trump struck an optimistic note, saying that the Lone Star State would be "up and running very quickly" and that Congress would quickly approve whatever funds are necessary for recovery, beyond available funding from the Federal Emergency Management Agency). "We think you're going to have what you need, and it's going to go fast," he said. (Eric Gay/AP) William Loosemore works at his smoker as he prepares food for first responders, volunteer and those in need of a meal, Aug. 29, 2017, in Rockport, Texas, where recovery after Hurricane Harvey continues. Loosemore is hoping President Donald Trump will stop by during his visit to Texas. He expressed awe over the sheer size of the storm. "It's the biggest ever," Trump said. "It's historic. It's really like Texas, if you think about it. But it is a historic amount of water in particular. There's never been anything like it." On Sunday he announced he would be traveling to Texas as soon as it was feasible, staying away from Houston and other areas of the state that were hit the hardest. Trump approved Abbott's request for a disaster proclamation Friday, activating a response from FEMA for relief to the state. ABC News' Katherine Faulders, Alex Mallin, Adam Kelsey and Mark Osborne contributed to this report.